"An addictive blend of magic and murder noir." - Gareth L.
Powell, BSFA award-winning author of Ack-Ack Macaque Agent "Sully" Sullivan is one of the top cops in the Imperial Bureau of Investigation. A veteran witch of the British Empire who isn't afraid to use her magical skills to crack a case. But Sully might need more than a good education and raw power to stop the string of grisly murders that have been springing up across the American Colonies. Every one of them marked by the same chilling calling card, a warning in the form of a legion of voices screaming out through the killers' mouths: "It IS tHe YEAr oF the KNife." Sully's investigation will drag her away from the comforts of home in New Amsterdam, the beautiful but useless hyacinth macaw that used to be her boss, and the loving arms of her undead girlfriend, in a thrilling race against time, demonic forces and a shadowy conspiracy that will do anything to keep its hold on power and ensure that Sully takes their secrets to her grave, as soon as possible. 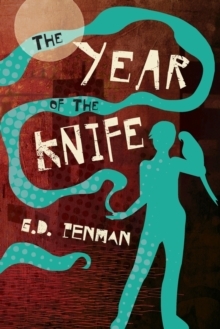 G.D. Penman's imaginative The Year of the Knife is a fun, fast-paced urban fantasy mystery with an engaging set of characters, most notably Agent Sully of the Imperial Bureau of Investigation.